"You always had it, Dorothy." It's my favorite moment in the Wizard of Oz when Glinda the Good Witch gives a gentle reminder of what should have been obvious all along. By "it" of course, she is referring to the power to return home, an answer Dorothy spent the entire film searching for. I've always believed she missed it because she was expecting something bigger, something that would hit her over the head, rather than quietly whisper in her ear. It's true that sometimes exactly what we're looking for has been right there all along and it doesn't always hit us over the head. I got that reminder recently when I was searching high and low for the perfect dessert to serve at a dinner party. I'd been pouring over my favorite cookbooks and websites. For me, it's not really a dinner party without something sweet and homemade to cap off the evening. I was looking for something homey and familiar, not overly fussy, but impressive and delicious enough to make my guests think I'd spent all day preparing it. I wanted them licking their forks and groaning in pleasure with that look that says: "I really want another piece even though I'm stuffed." I live for that look on people's faces. 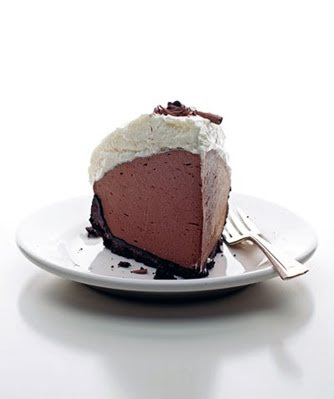 The answer came in the form of chocolate cream pie. Not just any chocolate cream pie, but the best chocolate cream pie I ever ate, according to my friend Beth. It was a very exuberant endorsement. "You have to make this pie, Dave. You HAVE to. You. Will. Die!" she exclaimed, in a giddy and overly-punctuated tone that drove her point home with laser-like precision. She explained that she'd just made a mile-high cream pie that appeared in the latest issue of Saveur magazine and it was so delicious, so over-the-top, she had to give most of it away because she couldn't stop eating it. I pictured a goldfish that just keeps eating until it explodes. "I don't know Beth...," I hesitated, as images of Jell-O Instant Pudding pushed their way into my head, "I have that magazine and I saw that pie and it looked pretty good, but I need something AH-mazing." The truth was I get so many food magazines every month I sometimes do little more than scan them walking back from the mailbox. I really had seen the recipe; it just didn't seem exciting enough to make me stop on the page. Beth wasn't having it. "You don't understand!" she replied breathlessly. "This pie is beyond amazing, it's RI-diculous! It starts with 9 egg yolks and almost a pound of chocolate! It's sooo good!" She had me at 9 egg yolks. That was all the convincing I needed. On the way home I stopped by the market and picked up the ingredients I needed to make this Holy Grail of chocolate pies. Standing in the checkout line I flipped through a copy of Saveur, found the recipe and took the time to actually read it. I was immediately hypnotized by the drool-worthy picture of the pie in the magazine and the geniusness of its back-to-basics simplicity. As I read further it became clear this was no ordinary chocolate cream pie. I bought that copy just in case I couldn't find my original at home. As I made the custard and piled it high into the chocolate shell to chill, I was of course licking the wooden spoon and scraping at the bowl to get every last bit of custard. It was heavenly. It was so dense with rich chocolate flavor and so creamy (undoubtedly from the 9 egg yolks) that I briefly considered skipping dinner all together and going straight to dessert. Needless to say the pie was a huge success at the dinner party. After the first bite, silence fell over the table. After the second bite, one of my guests spoke almost reverently, "OMG! This is the best chocolate cream pie I've ever eaten. This is really good!" I replayed the story of how I wasn't so easily swayed when Beth tried to convince me to make it for dessert. "It just seemed so ordinary," I confessed. Secretly I was a bit embarrassed that I gave her such a hard time. Licking their forks and groaning in pleasure my guests exclaimed, "Are you crazy?! This pie isn't ordinary, it's orgasmic! You HAVE to share this recipe!" Orgasmic indeed. Turns out the perfect dessert was right there under my nose, it was just buried in a large stack with all my other food magazines and unless that stack toppled over on me, it wasn't about to hit me over the head. Like Dorothy I just needed a gentle reminder that I'd always had it. The title alone should tell you everything you need to know on this one. A crunchy crust and pudding-like filling make this pie a standout. This pie should be well chilled before it’s served. Grease bottom and sides of a 9-inch glass pie plate with butter; set aside. Heat 8 tablespoons butter and brown sugar in a 1-quart saucepan until sugar dissolves. Transfer butter mixture to a medium bowl; stir in ground wafers. Transfer mixture to pie plate; press into bottom and sides, using the bottom of a measuring cup to compress crust. Refrigerate for 20 minutes. Bake until set, about 15 minutes; let cool. Heat half and half in a 4-quart saucepan over medium-high heat until it just begins to simmer; remove pan from heat. In a large bowl, whisk together 2⁄3 cup sugar and cornstarch; add egg yolks and whisk until smooth. Drizzle half-and-half into egg yolk mixture, whisking constantly, until smooth. Return mixture to saucepan; heat over medium heat. Cook, stirring often, until bubbles rise to the surface and mixture is very thick, 3 to 4 minutes. Remove pan from heat and add remaining butter and chocolates in small batches, whisking until smooth; stir in 1½ teaspoons vanilla. Set a sieve over a medium bowl and strain chocolate mixture. Cover with plastic wrap, pressing plastic onto surface to prevent skin from forming; refrigerate until set, about 4 hours. Remove plastic wrap from chocolate filling and, using a rubber spatula, stir mixture until smooth. Spoon mixture into reserved crust, forming a dome, and smooth surface with the spatula. In a large bowl, whisk remaining 2 tablespoons sugar, remaining vanilla, and heavy cream until stiff peaks form; spread on top of filling, forming a dome. Using a vegetable peeler, shave some of the dark chocolate onto top of pie. Keep refrigerated until ready to serve. This cake is something between a soufflé and a dense chocolate brownie. It's incredibly light and cloud-like. Light in texture mind you, NOT light in calories. In spite of that fact, I've always felt that if you're going to indulge in dessert it should be one that falls somewhere between nirvana and heaven and this cake certainly doesn't disappoint. If indeed there is a heaven, and if I make it there, I want to eat this cake every single day. Line the bottom a 9-inch springform pan with parchment paper and set aside. Meanwhile, melt the chocolate and the butter in a double boiler, or even better, in the microwave for about 2 minutes on medium power. Stir until smooth and set aside to cool. In a medium bowl, beat the egg yolks with 6 tablespoons of the sugar until the mixture is pale yellow and fluffy, about 5 minutes. Add vanilla, fold in the melted chocolate and set aside. Meanwhile, beat the egg whites in another medium bowl until soft peaks form. Gradually add the remaining 6 tablespoons of sugar and beat until medium-firm peaks form. Lighten the chocolate mixture by folding in a third of the eggs whites, then fold the remainder gently into the chocolate mixture, being careful to just incorporate, but not overwork the batter. A few white streaks are okay. Pour into prepared springform pan and bake in the center of the oven for 40 to 50 minutes, until the top is puffed and cracked and a tester inserted in the middle comes out with moist crumbs attached. Cool the pan completely on a wire rack, don’t be alarmed when the center sinks in and forms a crater. To release, run a small sharp knife around the the edge of the cake and release the sides of the pan. To make the orange scented whipped cream, whip the cream and vanilla until soft peaks form. Add the sugar, orange zest and the marshmallow to stabilize. Dollop the cream in the center of the cake and serve in large slices. Pure chocolate bliss! *To “stabilize” whipped cream, beat as usual and whip in one large marshmallow that has been softened for about 10 seconds in the microwave.